William was educated at Bradfield College and at Guy's Hospital, where he graduated in 1914, passing the Conjoint Examination. He was described as a boxer and all-round athlete, and a small yacht owner. As soon as he qualified he joined the R.A.M.C. at the rank of Lieutenant, and was promoted to Captain in January 1915. He was also in practice at Eastbourne. In January, 1916, whilst in medical charge of the Norwich Flying Corps he utilized his knowledge of mechanics and natural interest in machinery to learn to fly himself, and he was granted an Avas pilot's certificate - �an unusual distinction in the R.A.M.C.� Almost immediately afterwards he was ordered abroad, entering the war in India on the 11th. He was killed by an accidental gunshot wound at Jhansi, Central Provinces, India, and was buried in Jhansi Cantonment Cemetery. 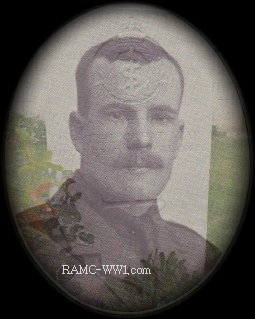 William was the only son of Howard Hill John Nicholls of 24 Downview Road, Worthing, West Sussex.